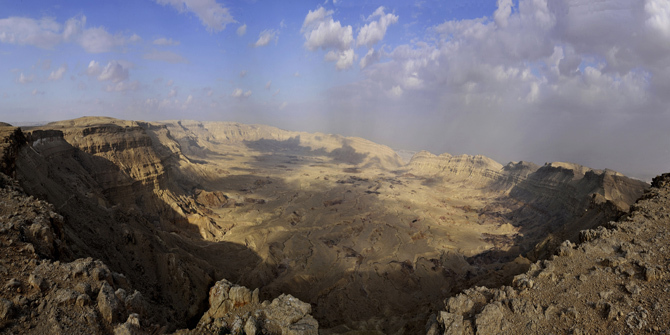 small crater, Wadi Zin, Masada, Dead Sea, Ein Gedi, Qumran, Timna park, big crater. will never be able to see what we saw. They will never feel what we felt. They never know what we knew, or understand what we cannot forget." Hotel or nice camps accommodation available upon special request. We begin our tour exploring the highlights of the Eilat Mountains Nature Reserve, rich in native wildlife such as gazelles, ibex, hyenas, wolves and hyrax. Visiting the beautiful Timna Valley, site of the world's first copper mines and host to many fascinating geological formations. The Arava Valley, which runs from the Dead Sea to Eilat, flanked on the east by the impressive Edom Mountains of Jordan and on the west by the cliffs of the Negev Plateau. The Eteq Canyon within Wadi Eteq has year round rock pools and constant shade and is popular with local wildlife. We can enjoy the views from local summits, which span the whole region. We spend the night in the picturesque settlement of Shaharut, where we enjoy our evening meal before settling for the night in its Arabian Style camp facility. Heading north we reach the area of Wadi Faran (which begins in Central Sinai and ends in the Negev). Here we enjoy a hike through the scenic Barak Canyon and Vardit Canyon. Moving on we join the legendary 'Spice Route' (also known as the 'Perfume Route'). This ancient trading route is notable for interesting archeological sites, beautiful views and breathtaking scenery. Along this route we reach the 'Ramon Crater' (by way of the Nekorot Valley which drains the crater following rain). The Ramon Crater is a geological phenomenon some 40km long, here we leave the 'Spice Route' and journey through part of the crater. Leaving the crater by way of the Lotz Valley, we find 'Atlantic Pistachia' trees dating over 1,500 years. Continuing our journey towards the ancient ruins of 'Ovdat' (second largest Nabatean City after Petra) and to the largest Wadi in the Negev desert, Wadi Tzin. Here are found the small pools of Ein Ovdat, in which we can bathe, conditions permitting. Continuing through Wadi Tzin we join the 'Scorpions Ascent', an ancient Roman Route which winds up one of the steep sides of the 'Small Crater' to the very top. From above, the crater and its surrounding area have an unusual moon-like appearance. From here descend to the area of the Dead Sea, which lies just beside the Judean Desert. The landscape surrounding The Dead Sea is diverse and at times quite bizarre, some areas have an alien quality, which particularly evident in the 'Pratzim Valley' and its strange 'Flour Cave'. On the summit of one of the mountains overlooking the Dead Sea is King Herod's famous fortress 'Masada'. A rich archeological site, Masada is steeped in history and is one of the most popular attractions in Israel. North of Masada is 'Ein Gedi', the largest oasis on the Israeli side of the Dead Sea, here we see springs and waterfalls flowing through canyons. Local wildlife are drawn to the area by the constant water supply, the plentiful food provided by the flourishing vegetation and the cool shade from the abundance of huge trees. A visit to this area would hardly be complete without a nice 'float' in the Dead Sea along with a quick (or if you prefer, long) visit to the spa and a good smothering in the mineral rich Dead Sea mud, famous throughout history for its beautifying qualities. After all this, by the end of your tour, you'll not only be feeling good, maybe you'll look ten years younger too! Price per day: 2 people- $560, 3-5 people- $630, 6+people- $115 each. not incl lunch $16 p.p. lunch suplement: 20$ per per person per day. Inc. Spice Route, Ramon Crater and the Eilat Mts. Day 1- Setting off from Eilat in Jeeps, we journey off-road into the sandy Arava Valley passing salt pools that are home to a flock of Flamingos. From here we head west and begin our ascent to the Negev Plateau on a dramatic 4X4 route. Driving on the way through the beautiful Wadi Eteq where we stop to explore by foot the Eteq Canyon, a favorite spot for many of the local wildlife and home to many varieties of desert plants. From here we continue our journey on to Mt. Berech and its views over the Timna Valley. On top of the Negev Plateau we journey by way of the beautiful ‘Gypsum Valley', before settling for the night in Shacharut 'Chan': a place of rest for desert travelers (designed like a Bedouin tent with carpets and mattresses laid over the floor). Here we have our evening meal and spend the night. A 3 hours camel tour for the sunset along the Negev cliff can be combined during this day. Day 2- Departing early morning and heading north to the beautiful Ashush Valley. Here we enjoy an impressive 4X4 ride and witness the interesting geological sights including the layers of limestone and flint that make up the valley walls. Continuing off-road through to Mo'ah where we join the ‘spice route'. Along the spice route you enjoy the same breathtaking views as the ancient merchants who traveled here thousands of years earlier. You will stop at some of the archeological sites and ruins found along the route before reaching the Ramon Crater. In one of the beautiful hidden spots of Wadi Nekarot we will enjoy our evening meal before settling down for the night. Day 3- We explore the Negev's' geological wonder, The Ramon Crater. From the bottom of the crater we ascend the craters walls by way of 'Noah's ascent. Having reached the top of the craters cliffs we drive along their edge till Mitzpe Ramon. From here we head west to the Eilot* Valley near the Sinai border. In this valley we see Atlantic Pistacia trees dating back 2000 years and enjoy another incredible ride through the stunning nature of the area. We exit the Eilot valley right beside the Egyptian border and head back during the evening to Eilat. Following the same route as the ancient Nabatean Merchants, we experience the same sights and views in much the same spirit as they did thousands of years earlier. This three-day (plus 3-night) camel tour begins during the evening at the ruins of one of the ancient rest stops on the famous 'Spice Route' called Mo'ha. Today local Bedouins offer the same services to travelers as were offered in ancient times, water, food and accommodation. Today's 'modern' services also include shower and toilet facilities. Having spent the night in their Bedouin tent, we begin our camel journey along the Spice Route. Throughout the tour we alternate between riding and hiking. This tour covers the most picturesque and scenic part of the route and during the first day we enjoy the beautiful views between the ancient Mo'ha and Katzra Rest Stops. Stopping on the way for small breaks and a picnic lunch. Having passed Katzra we reach Mt. Masa at the foot of the mount we settle for our evening meal and spend night under the starry skies. On the 4th and final day we journey to the crater wall and onto one of the most dramatic hiking routes in the Negev, an ascent that takes us right to the top of the Ramon Crater. Having reached the top of the crater's cliffs and the end of our desert adventure, we rest to enjoy the remarkable views and reflect on the three Arabian days and nights that we have spent in this unique desert area. The Eilat Mountains in the Southern Negev desert are home to some of the most spectacular views in the whole of the Negev Desert. Our hiking and trekking expeditions leads you through canyons and over mountain paths to places almost inaccessible. We cross the Negev Plateau and hike down the most picturesque mountain paths in the area. Carrying in our packs only what is necessary for the day's trek. We are met each evening by jeeps that take us back to Eilat or bring equipment for camping outdoors. The tour includes meals, 4x4 transportation, an experienced guide. Day 1- The tour starts at the summit of Mt. Yehoahaz 900 m' above sea level and leads us down to the 'lost Valley'- a sandstone canyon, onto Mt. Shehoret, and through the Shehoret Canyon. Setting up camp. Day 2- Beginning at the Amram pillars, climbing Mt. Amir where ancient copper mines are found and walking along the Negev cliffs to the hidden valley another colored sand stone canyon. A harder walk but consider to be the most scenic hike in the Eilat Mts. Camping in the area of the Lost Valley or in Eilat. Price: Up to 2 people $420 per day total, 3-4 people $480 per day total 5 people or more - $115 person per day. Incl: Guide and a jeep for the begining and end of tour. Day 1: Arriving at the small village of Shaharut we are welcomed by the locals in their huge Arabian tent known as ‘The Khan' (a lodging tent for desert travelers), it is laden with mattresses and carpets for oriental comfort and enjoys what are probably the most breathtaking views in the whole of the Negev. Here we enjoy desert hospitality while final preparations for our tour take place, we are introduced to our camels and by sunset enjoy a short camel tour along the cliffs of the Arava (rift valley). Returning to The Khan by dusk we enjoy our evening meal and a briefing on the upcoming tour days before settling for an Arabian night on the mattresses of The Khan. Day 2: Following breakfast we pack our belongings and equipment into our saddle bags and board our camels. We set off from Shaharut along a picturesque camel track that takes us through the wadis of Isaron, Zugan, G'dera and Tse'alla. Following sunset we reach the Well of Milhan – (an ancient well restored during the British mandate) Here we set up camp for the night under the desert skies. Approx. 15 km is covered on this day . Day 3: From Milhan well we continue south to Mt. Berekh which, at 850m above sea level, is the highest in the area. We walk through Metek Creek where we find colorful rocks of gypsum crystals. This route takes to Mt. Berekh's fantastic views over the famous Timna Valley, site of the worlds first copper mines. We continue until we reach Mt. Bosmat where we set up camp. Approx. 12km covered on this day . Day 4: From Mt. Bosmat we head to Wadi Eteq and the Eteq Canyon. Year round rock pools within the canyon make this area a popular spot for wildlife. The more adventurous participants can, with the aid of the ropes and ladders fitted to the canyons walls, explore the hidden beauty of the Eteq canyon. From here our camel voyage continues up the Eteq Ascent to the Negev Plateau. Here we enjoy our final rest-stop that marks the end of our tour, from here we head for the main road and are met by the vehicles that will take us us back to civilization. The Red Canyon: Eilat Mts.